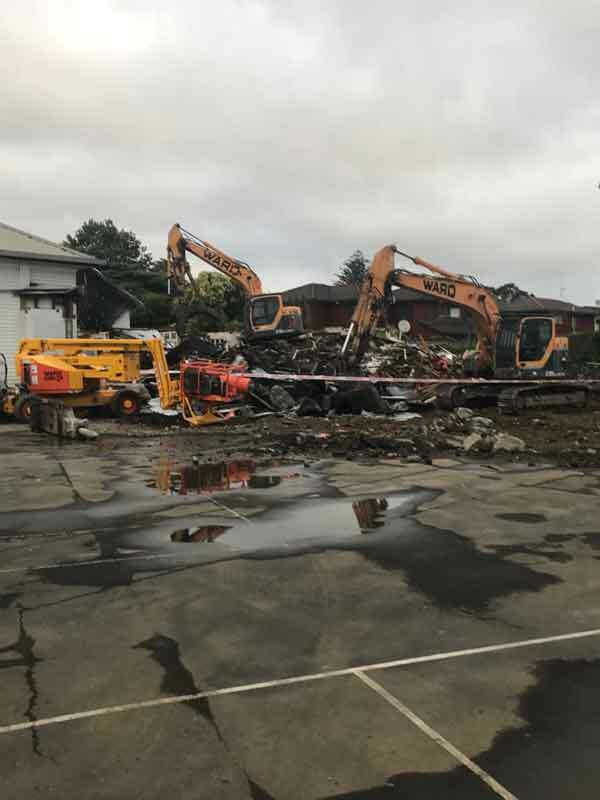 Wednesday 23 January a fire broke out in the school hall causing significant damage to not only the hall, but adjoining buildings. All staff and persons on-site were safe and accounted for. It was later confirmed that the extent of the damage was limited to the hall and the specialist teaching area – which resulted in these buildings needing to be demolished. 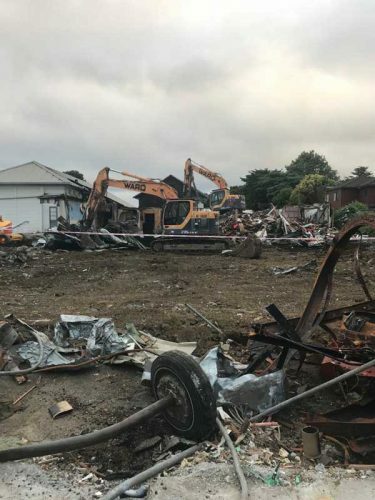 Below is some footage of the demolition that followed. This will be the final website update about events related to our devastating fire last week. The video below show the demolition progress. 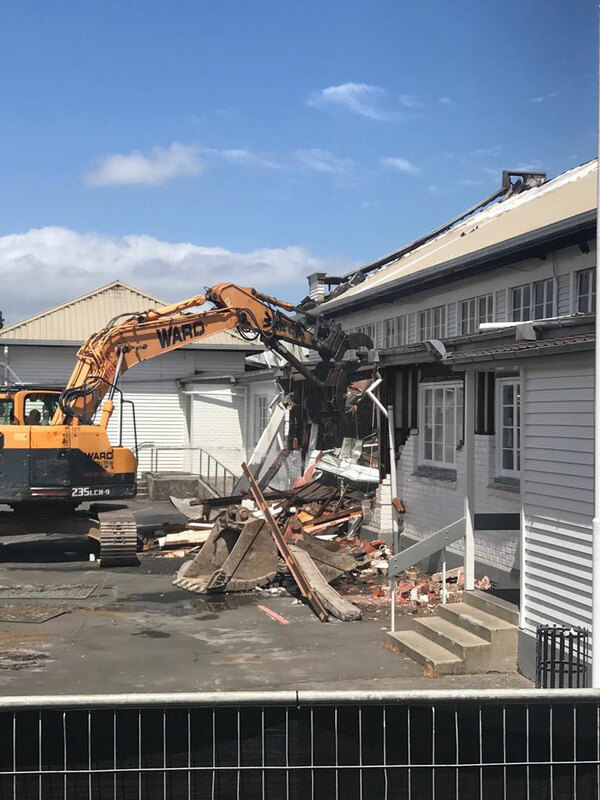 To date the hall, music and technology blocks have all been demolished with the science, dance /drama and art completed this weekend. 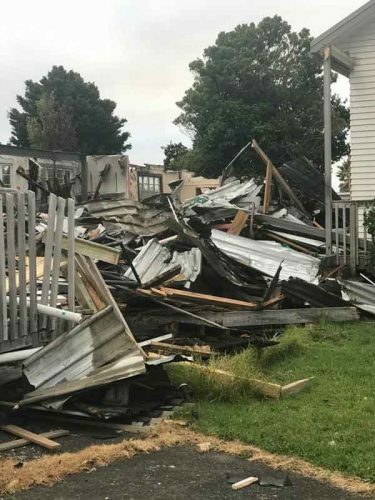 We hope to have the rubble and debris removed by Monday. I’m sure you can appreciate this is a massive job and while our contractors are working very efficiently there is a possibility it may not be finished by Sunday evening., This will only effect two teaching classes ( closest to the fire) who will be housed in the library for a couple of days. On the first day back we will have the Ministry of Education Trauma Team and our school Educational Psychologist on site to support any families or children that may be concerned about the recent events. We all deal with trauma differently and for some people seeing the buildings flattened could trigger mixed emotions. If you would like to chat to them please let the class teacher or member of the SLT- we can direct you. I’m sure you are aware of start up arrangements for the first day of school on 4th February. If not please look at an earlier post as they are detailed there. If you have any questions give us a call and we will tell you (09 6301109). 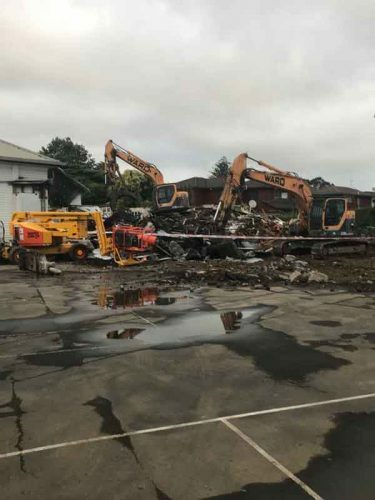 Over the weekend there was quite a bit of demolition action at the school and our website pictures have been updated to reflect this. I’ll keep updating you during the week so you know what to expect when school starts. 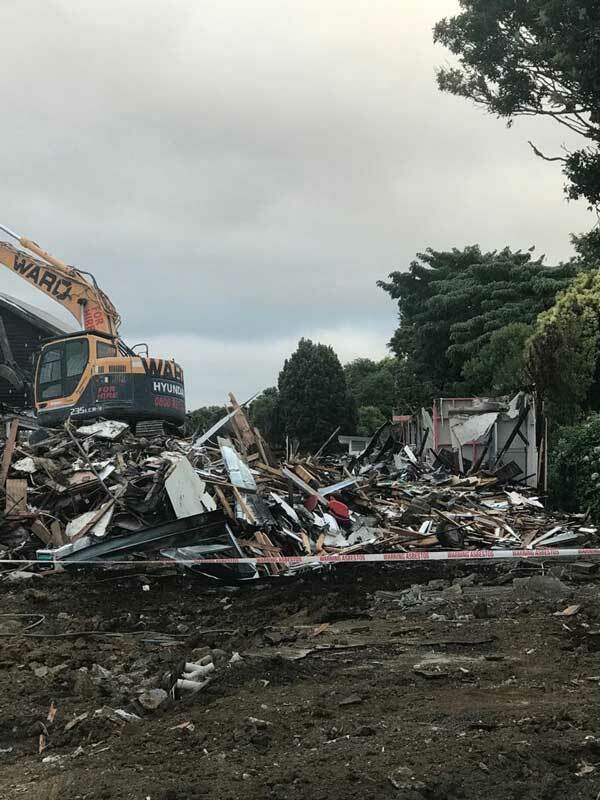 If you are intending to come down and take a look please do not use Poronui Street entry as there is heavy machinery operating from that area. The other entry points ( Disraeli Street and St Andrews Road are fine). The school office is closed tomorrow as we have no water. Hopefully it will be back on by Wednesday and a skeleton staff will be available onsite. The main telephone line has been transferred to a mobile number and office staff will answer your call between 8 am and 4pm. Our main method of communication is via School Apps and the website. However, we will be emailing you in the next few days as a test run to check we have your correct email address. If you don’t get an email from us , it means we do not have your correct email details. Please contact us to update as soon as possible. Think that’s it for now, have a good week ahead. School phones are not working but mobile is, so you can reach us on 022 584 5190 (Helen). Thank you for your patience and gestures of good will over the past few days as we have dealt with the devastating fire that took place on Wednesday 23 January 2019. At 2pm on Friday 25 January 2019 on we were advised by the Ministry of Education that it was not viable to restore the buildings and they were to be demolished. 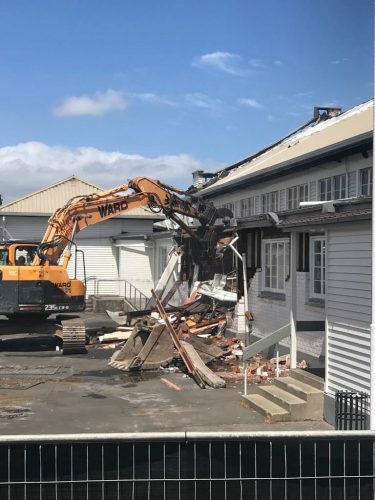 This was sad news to us given the historical nature of these buildings and the special role they played in the life of the school. The damage was too extensive to make them good again so we are now facing a rebuild. Demolition started at 3pm that same day. Please feel free to come down and see the action but the contractors have asked you keep a safe distance and stand on the field. As mentioned in a previous post, our start date has been delayed until Monday 4 February. The University of Auckland (Epsom Campus) in Mount Eden have kindly allowed us to use their gymnasium on this date as a meeting point for our first day. Unfortunately the gymnasium is not as large as our hall which means we will need to do a staggered start. Directions to get to the gym are on the map provided. PLEASE NOTE – The organisation below relates to the surname of your child. Eg: If your name is Peter Wilson and you are in Year 8 this year, you will need to be at the Auckland University (Epsom Campus) gym by 12.30pm. Although the rest of Peter Wilson’s family has the surname Jones, he still attends at 12.30pm on Monday 4 February as his surname starts with “W”. Parents you are most welcome to join us at these times where classes will be called. We are also intending to do a debrief with each group of students around the recent fire and changes that will be occurring as our plans unfold. 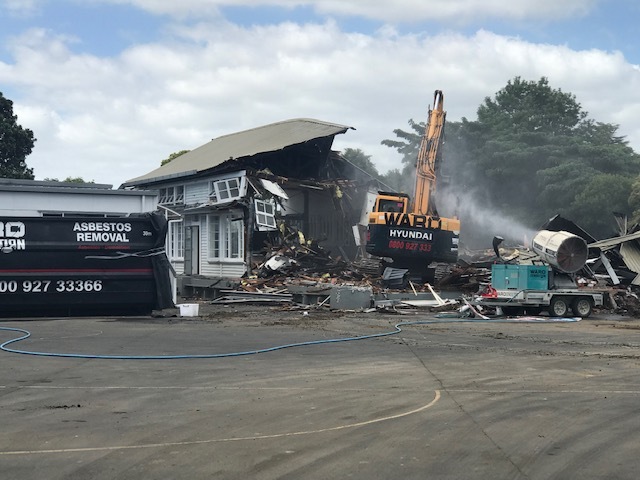 The school office will be closed this week during demolition due to health and safety reasons, however we do have our office staff available by mobile and email. The details, in addition to uniform shop hours for next week will be posted separately, later this weekend. If you have any questions or require further information prior to the start date, we are all here to help and our email contacts are on this website. Since Wednesday’s devastating fire, our senior leadership team, neighbours and various agencies and consultants we are working with have been interviewed by a number of different media. That information has then been pieced together and gaps filled. 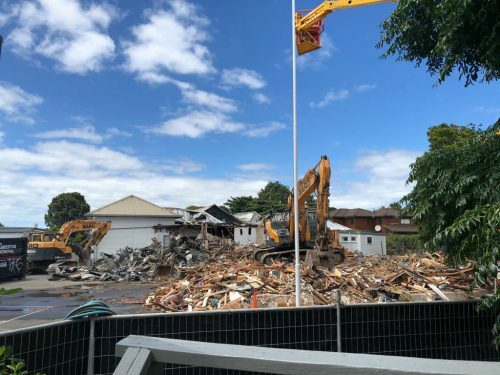 Unfortunately, some of that gap filling has resulted in the conclusion that it will potentially be some time before Auckland Normal Intermediate students and staff return to our school. 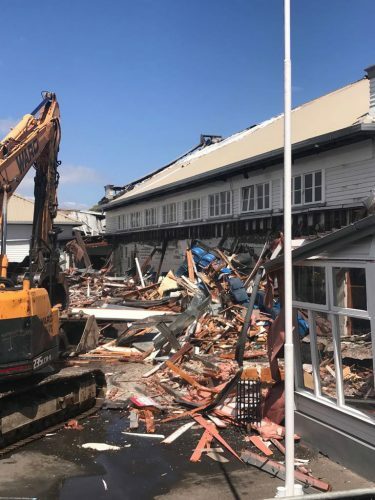 I would like to reassure the community that we have made amazing progress towards reopening the school in a very short time and that the extent of the damage is limited to the hall and the specialist teaching area. At this stage, we have been advised that no classrooms have been damaged, by smoke, fire or water. Significant parts, if not all, of the hall and specialist area will need to be demolished. We are hoping to be able to start this work today. All required approvals from Council and Work Safe have been obtained and preparatory works have begun. Nearby residents will receive some additional information in their letter boxes this morning about potential disruption and noise. We have been advised that the bulk of the demolition work will be complete so that we can open the school on our existing site on 4 February. More details on when and where the students should go will be provided by staff shortly. The Ministry of Education has been very responsive and it has already found a number of prefabricated classes that will be moved onto the school grounds. 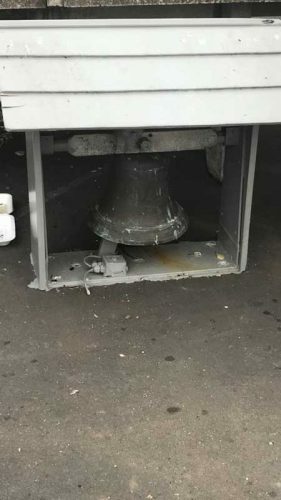 They will take about three to four weeks to install, including connections to power and water. Exactly how these classrooms will be used is still being discussed. Discussions are continuing with the University of Auckland around temporarily using some of their facilities such as the gymnasium and their specialist teaching areas. These talks have been very positive and we will provide an update as soon as we can. This is also a difficult time for our staff. Our Specialist teachers, in particular, have lost not only their teaching environment but also their teaching materials. However, all staff feel the loss that this devastating event has generated. We are meeting with all staff today to discuss how we can best mitigate the impact of the fire on staff and students, as well as seize all the opportunities it brings. I would like to take this opportunity to thank you all so much for your support for our team. We will keep you posted and if you have any questions please contact the school. We would like to advise that due to the initial assessment of the damage caused by the fire at the school yesterday, a decision has been made to close the school for the week of the 28th January. 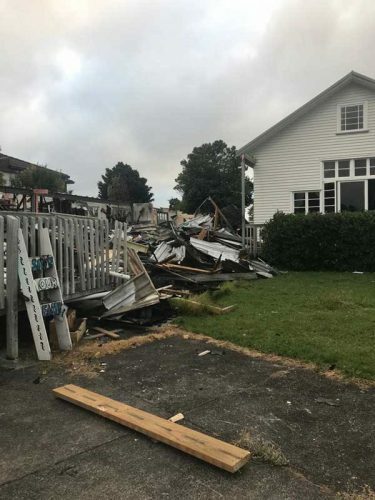 The impact on the school is yet to be fully assessed as we work closely with Fire and Emergency New Zealand and the Ministry of Education. Our priority is to provide a safe environment for our students and staff and as there is still uncertainty around the operation of the school as a result of this incident we have made the decision early to give time to make arrangements for students for next week. As things progress we will keep you updated. Thank you again for your support. ANI office closed today. A communication will be sent out this morning with an update. Fire now contained and we are working with other agencies to determine the extent of the damage for the opening of school next week. 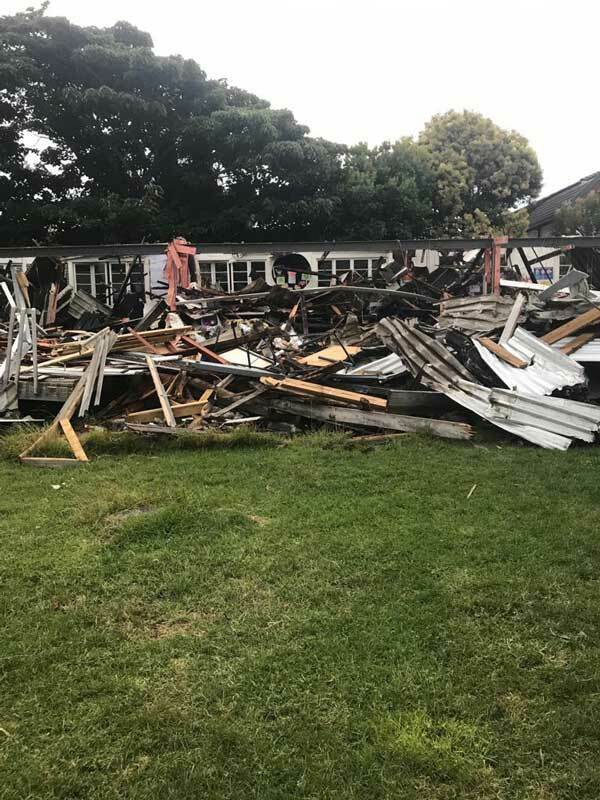 Earlier this afternoon a fire broke out in the school hall causing significant damage not only the hall, but adjoining buildings. 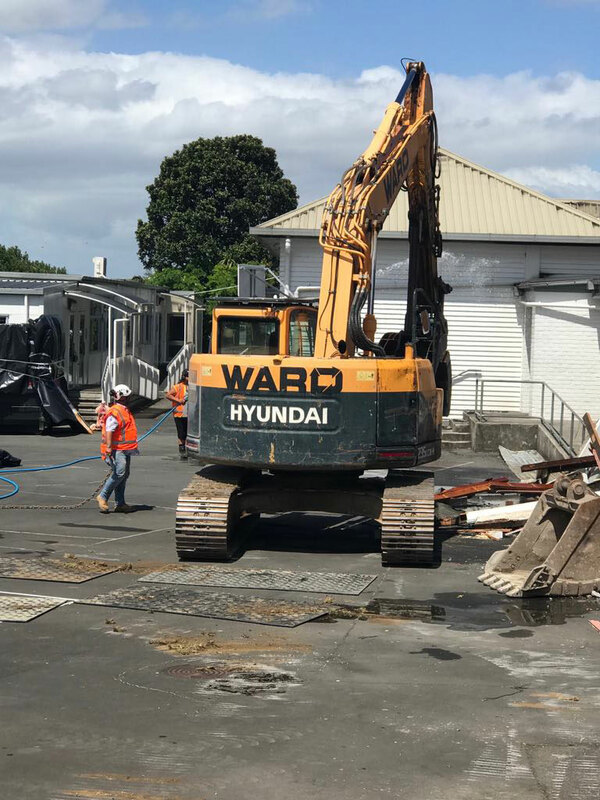 We are still in the early stages of working with other agencies to determine the impact on the school and how, if any, it will have on the opening of the school on the 29th of January. We will keep you updated as soon as we have any further information. This is a timely reminder to everyone that emergencies can occur at any stage and the school has robust plans to deal with a range of situations. All staff that were on-site at the time were evacuated quickly and safely. I would like to personally thank you for your ongoing support and we will keep you updated. Wednesday 23 January a fire broke out in the school hall causing significant damage to not only the hall, but adjoining buildings. All staff and persons on-site were safe and accounted for. 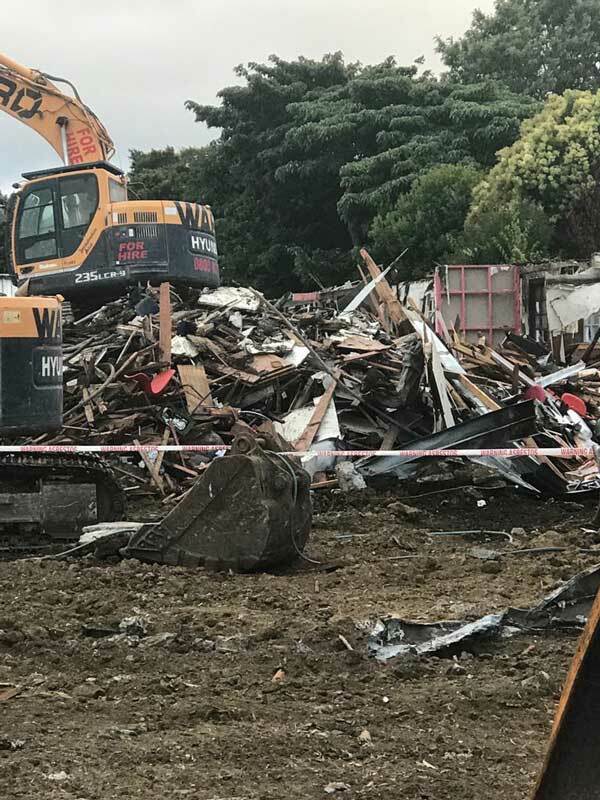 The extent of the damage was limited to the hall and the specialist teaching area – which resulted in these buildings needing to be demolished. Below is some footage of the demolition that followed.